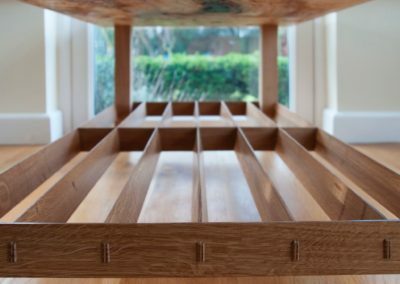 Vanishing Point was commissioned by existing clients who wanted a table to fill a specific space in their minimally furnished home. 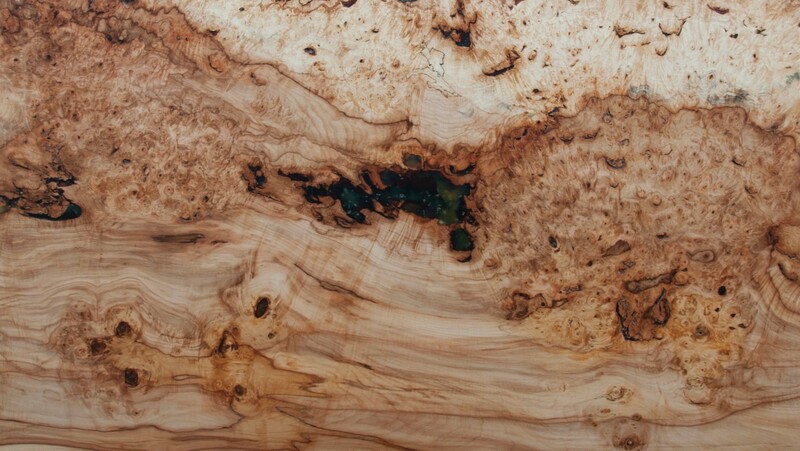 They wanted a piece that had a presence, voice, refined strength and beauty at the same time. 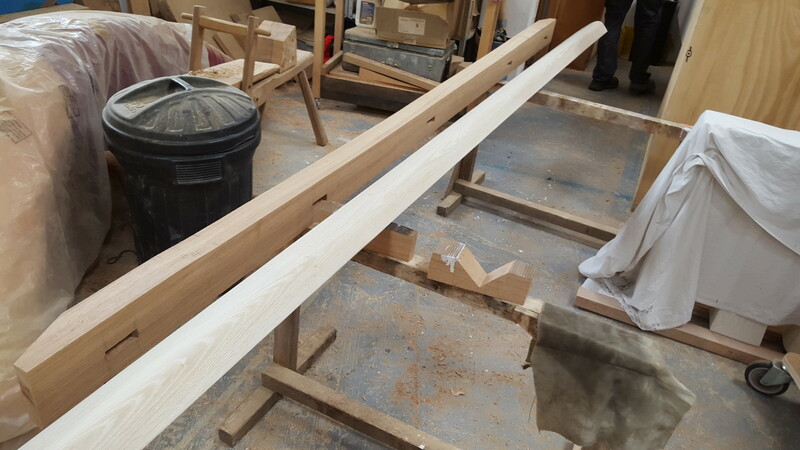 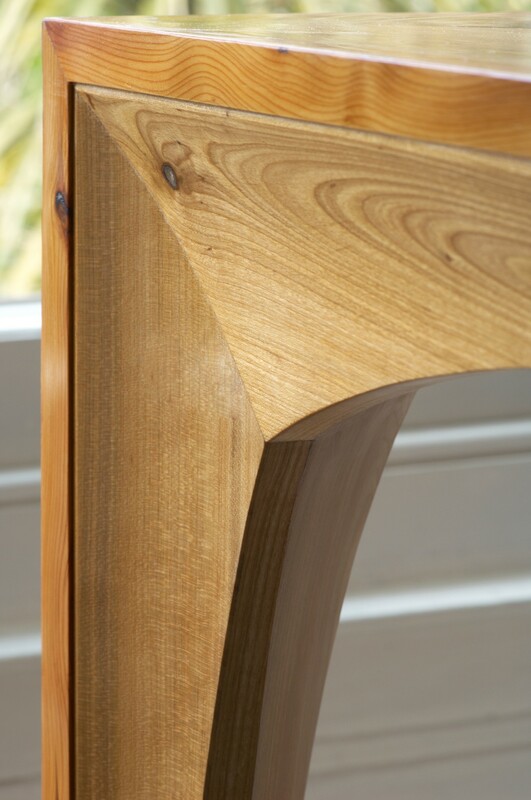 Vanishing Point combines two lovely timbers, both grown in Sussex; English cherry for the main material and English Yew for the detailing. 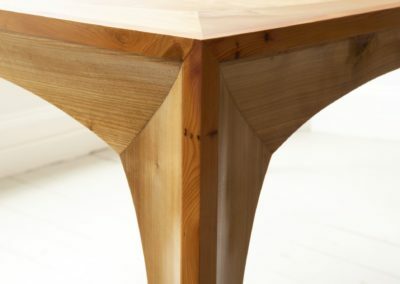 The table is a composite of modern making techniques that allow the table to perform and function. 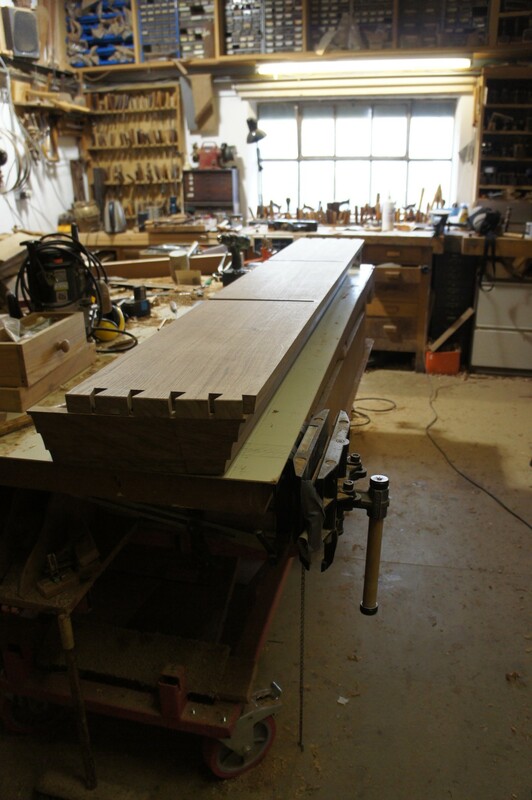 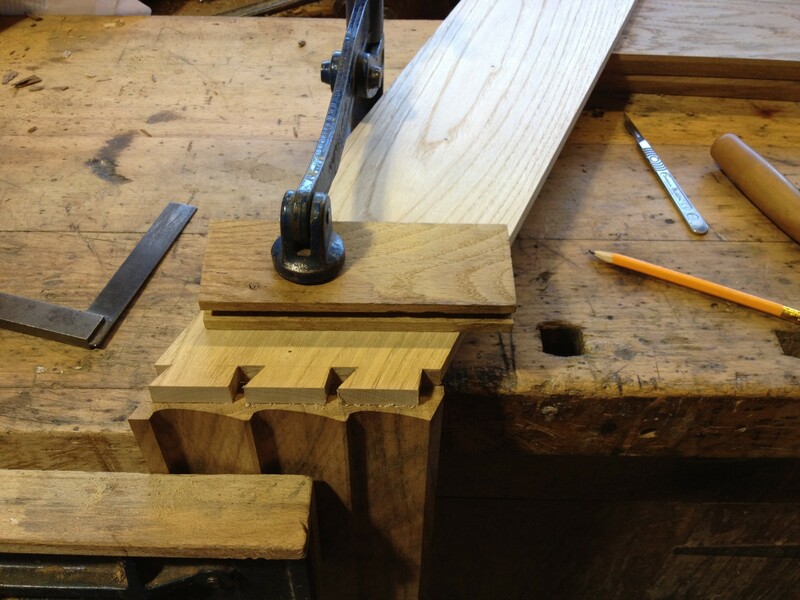 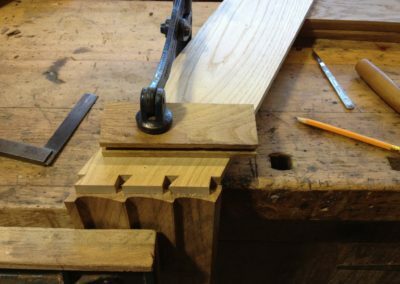 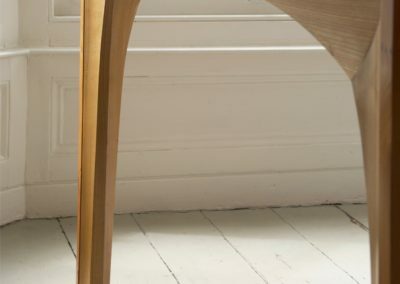 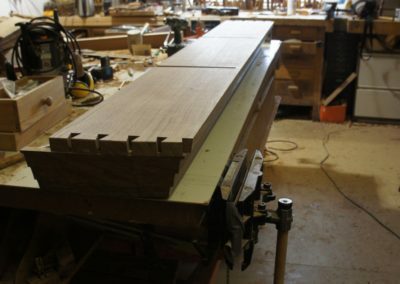 Vanishing Point’s curved apron rails use the same cut of timber as the edging and is book matched. 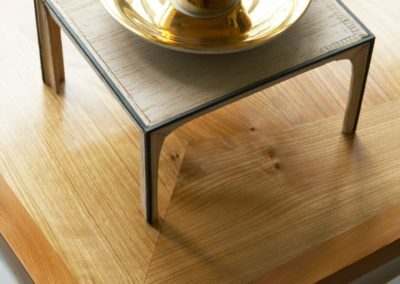 The consideration of this detail gives a harmony and the appearance of oneness with the edge when looking at the table from the side. 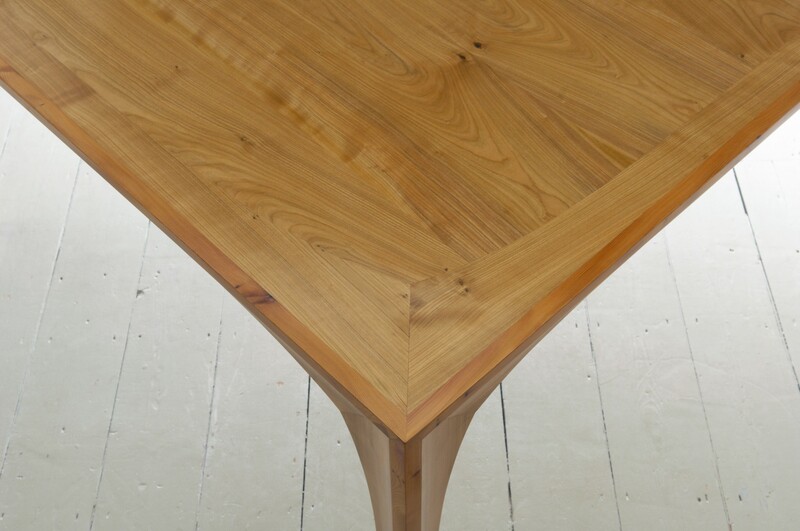 All the cherry wood used was cut from the same tree which ensures a consistency of colour and growth ring space. 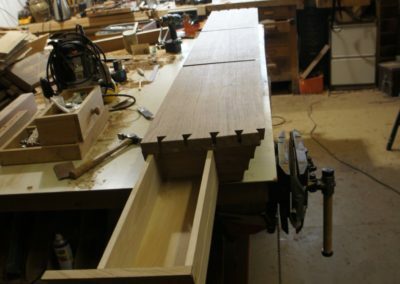 Vanishing Point would also work using other combinations of timber. 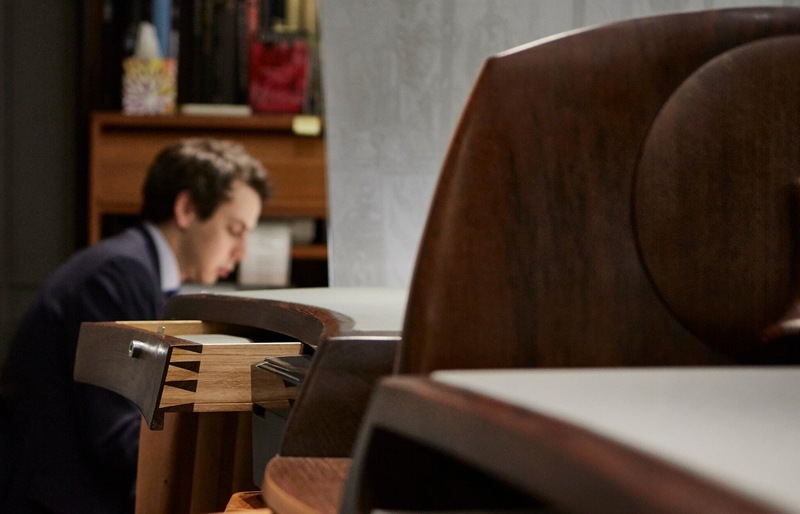 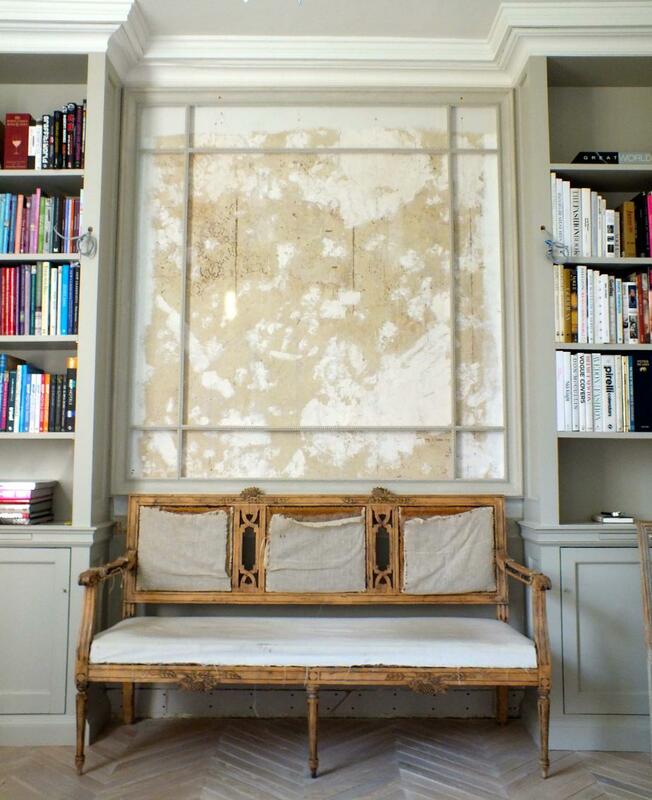 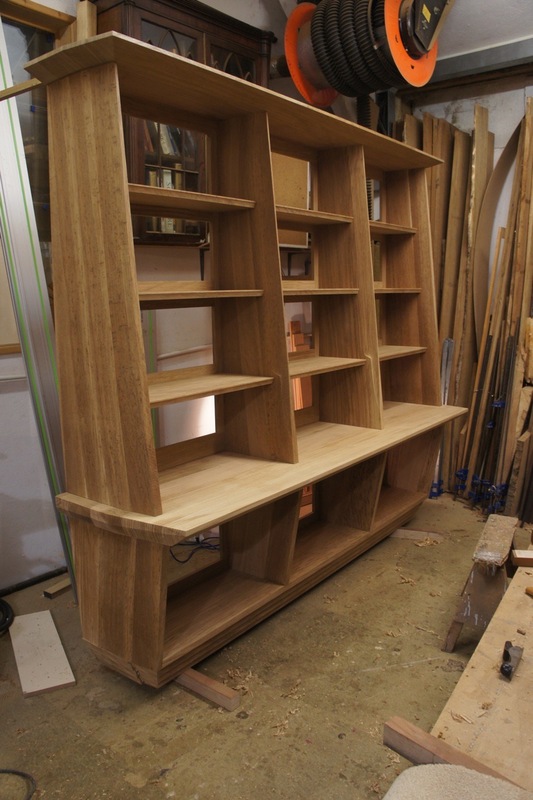 S A Spooner was invited to design and make a contemporary bookcase for existing clients. 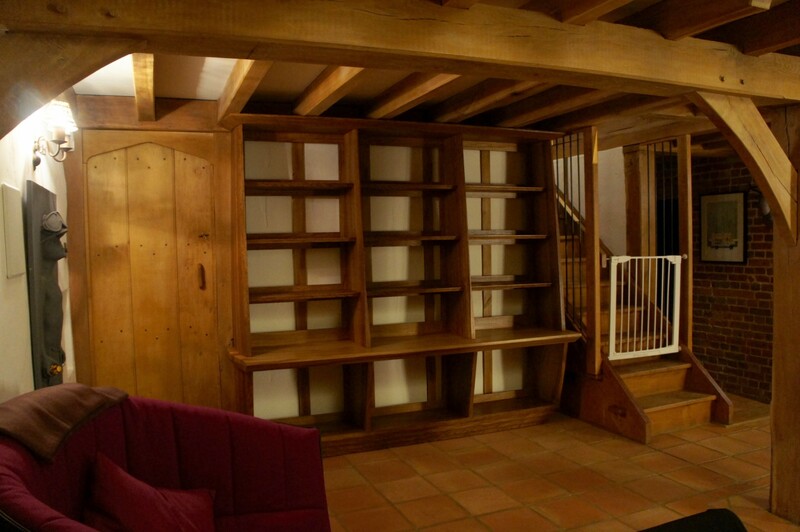 The brief was completely open other than to fill the space. 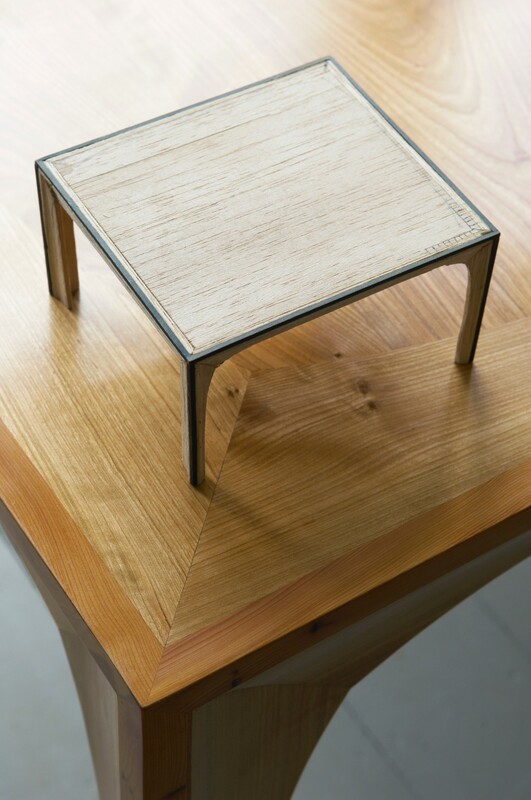 During our initial meeting with the client’s usage was discussed and a design was formulated. 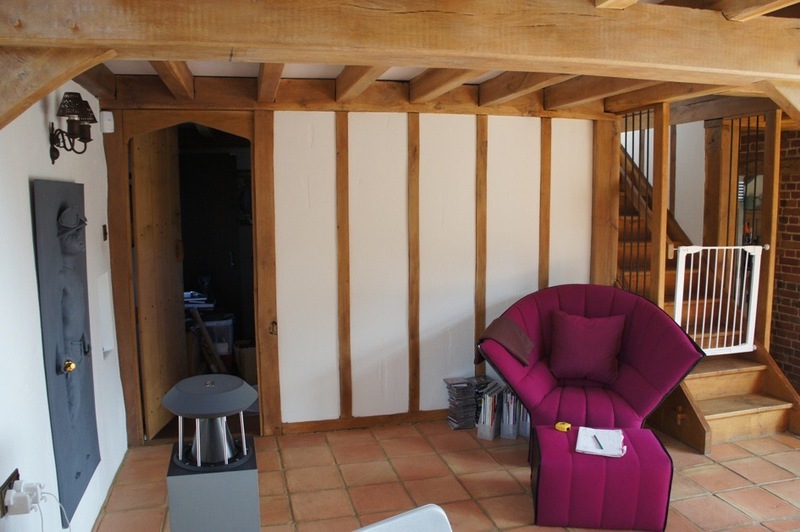 The location was then photographed and measured to draw up the design and complete the paperwork. 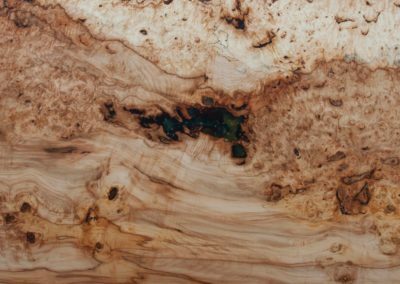 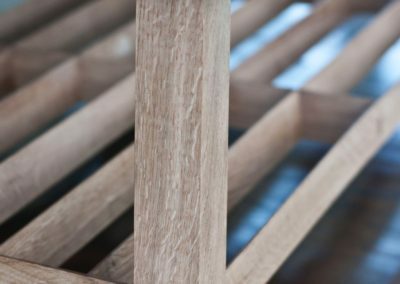 The wood we chose for the client is known as ‘brown oak’ which is an English oak tree but is different due to its natural dark chocolate colour. 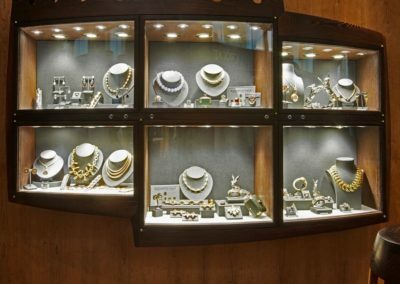 This happens due to the location of growth and mineral content of that location. 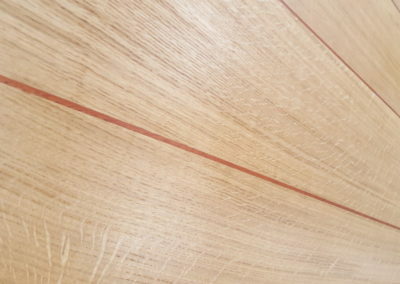 It can vary from streaky to fully brown. 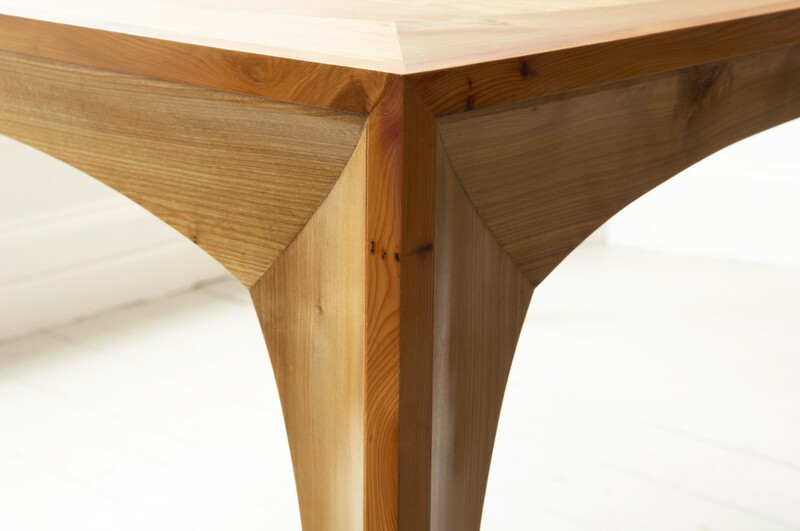 Our Design incorporates the use of thick section solid timber that tapers down to refined sculpted edges. 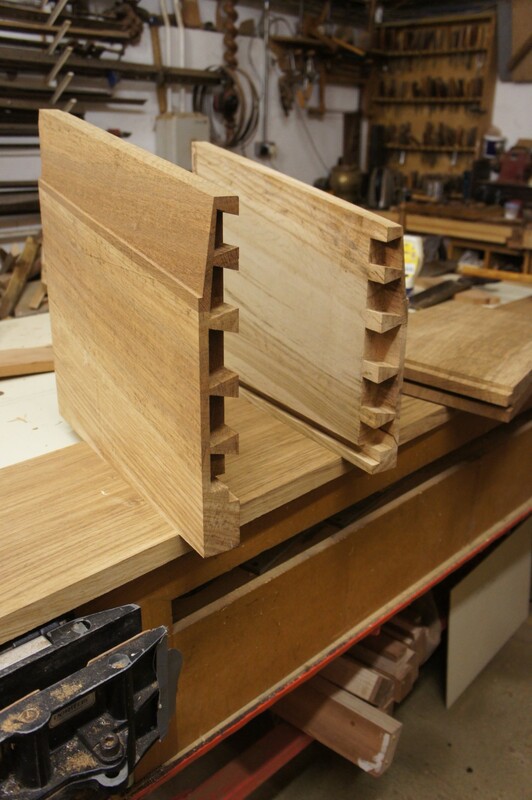 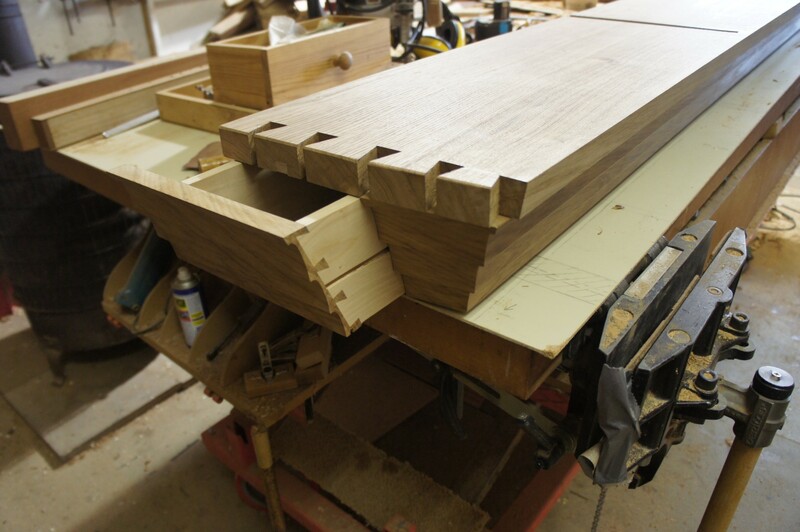 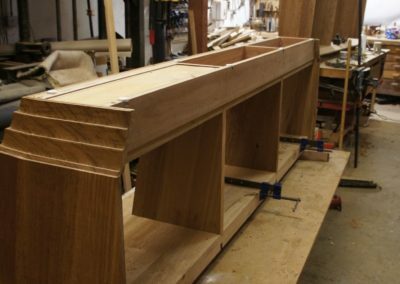 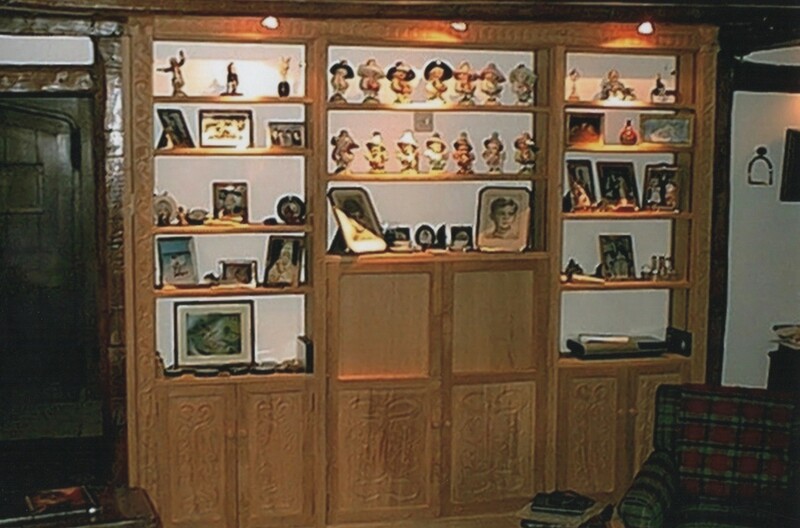 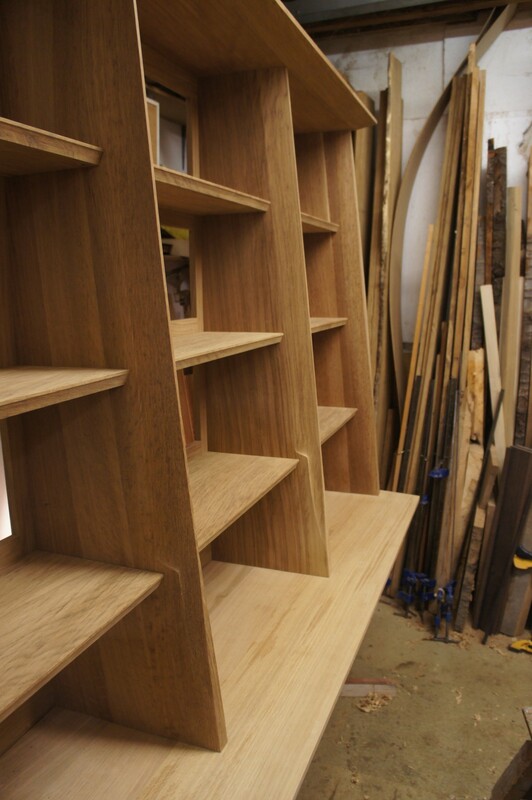 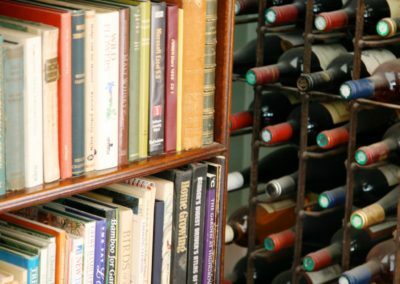 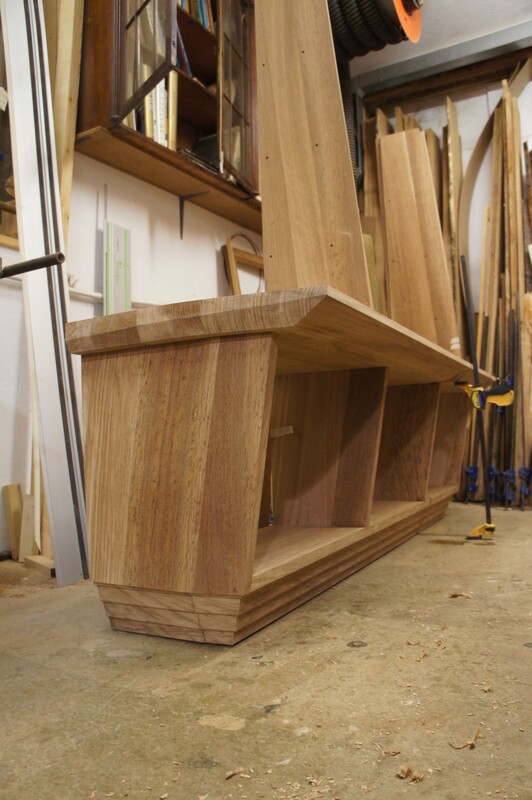 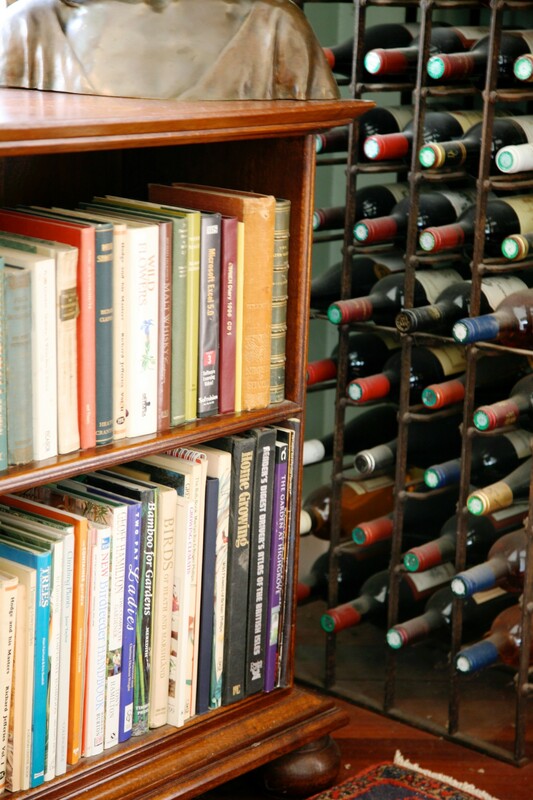 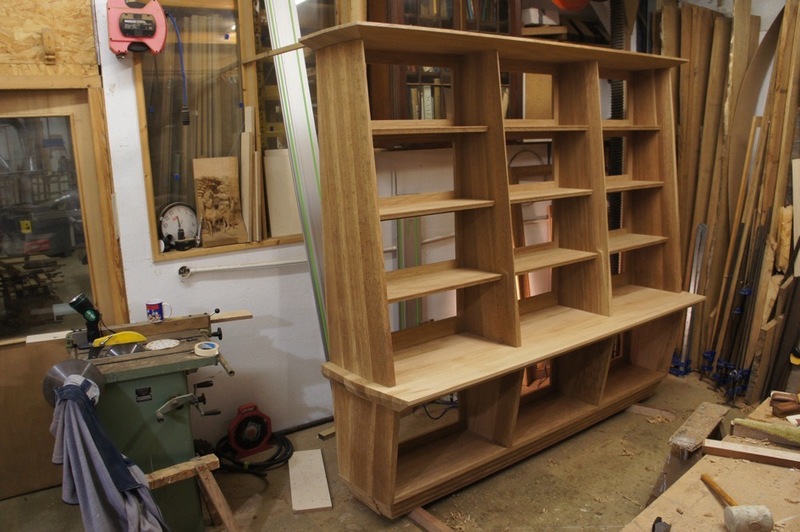 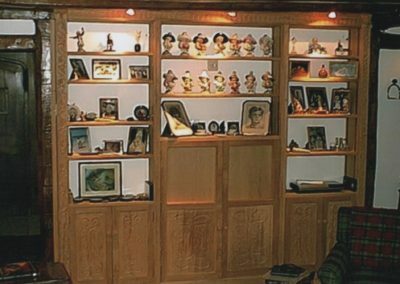 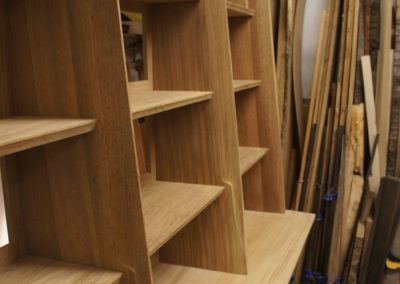 The whole bookcase has been crafted with the use of dovetail joinery. 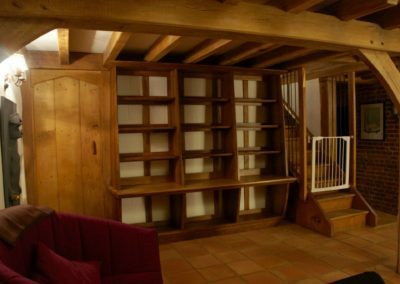 S A Spooner was involved in other projects in this location, see the Cantilever Staircase on the Staircases page. 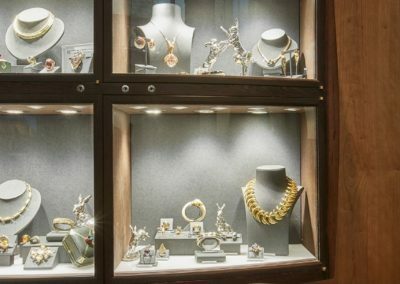 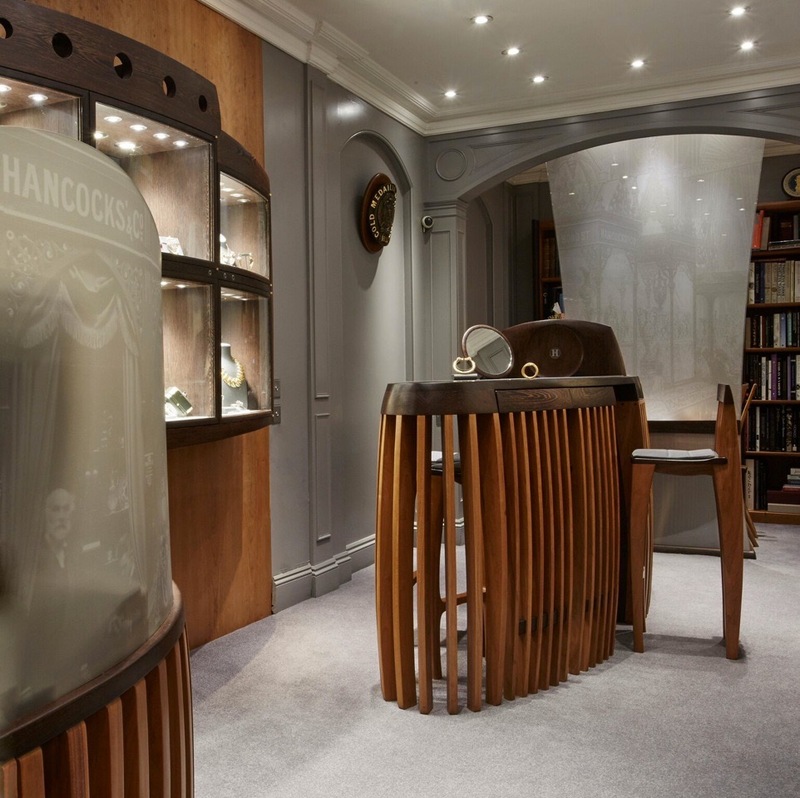 Hancocks, a well respected high-end jewellers in the famous London compact historic boutique site, Burlington Arcade. 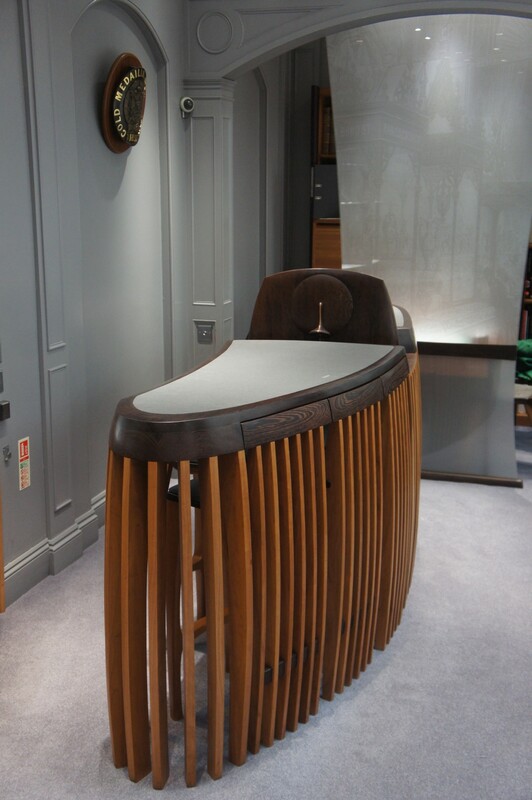 Client brief was for a new contemporary looking suite of bespoke furniture for the jewellery boutique. 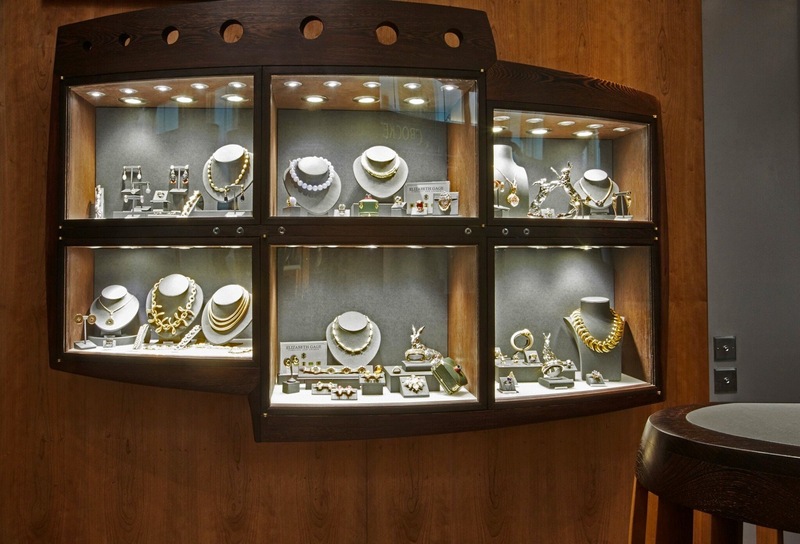 Established for over 100 years, Hancocks is renowned for the best of quality items and the highest of standards. 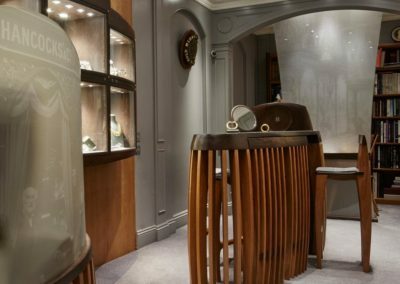 The design of the furniture was to embody this while achieving effective, secure display of merchandise, maximise use of space and enable clients to safely and effectively navigate throughout the boutique to effortlessly view merchandise as required. The suite to comprises of a free standing sales counter with storage for two hand mirrors, a computer desk and a wall display unit. 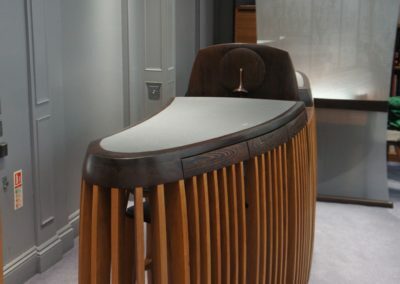 The computer desk to hide the modem retail toys needed for day to day operations. 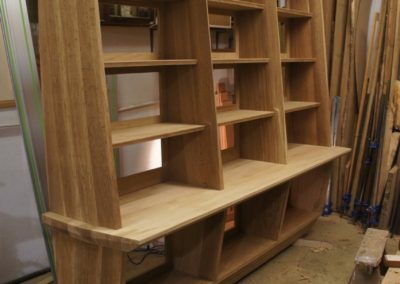 In order to keep the shop floor uncluttered, the main sales counter unit was to also to include storage of chairs for clients when not in use The counter unit sports a divider between the two desks to give privacy to customers while being served, this also houses a pair of mirrors which can be handed to the clients when required. 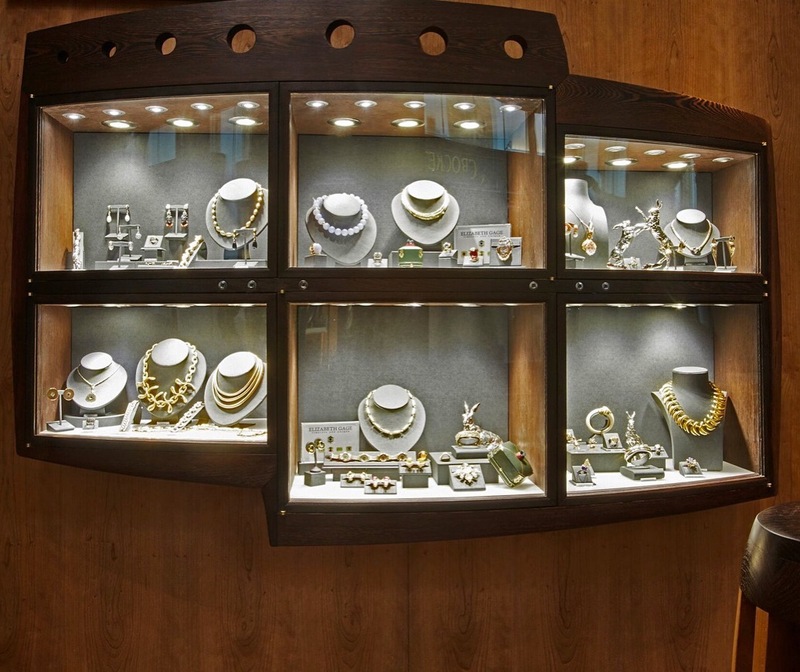 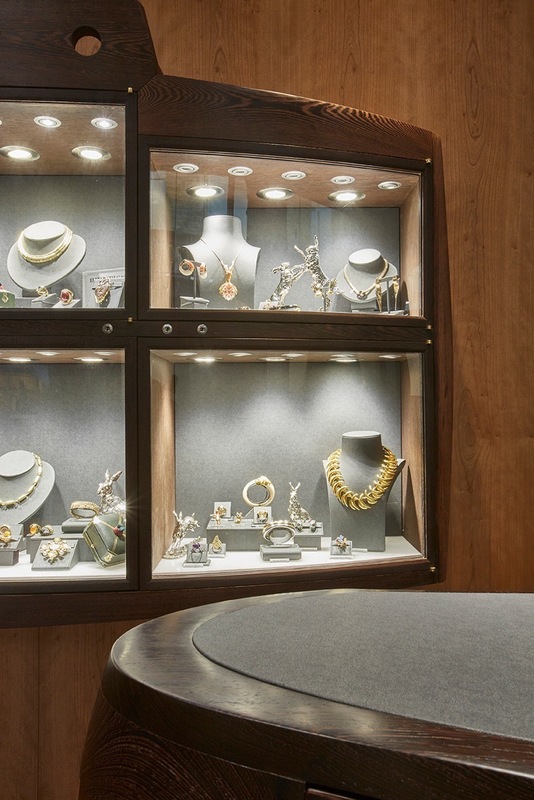 This comprehensive brief resulted in the curved, sculpted design of the wall display cabinet which enabled access and passage of staff and customers comfortably to and around the cabinet and the main sculpted sales counter. 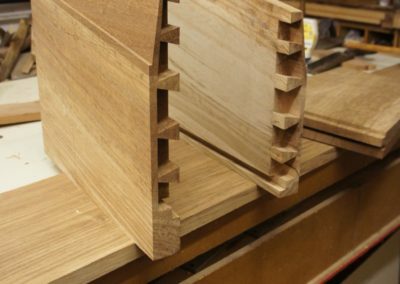 Wenge, an African hard wood was used for the display cabinet, with wenge and American cherry wood for the main part of the desks. 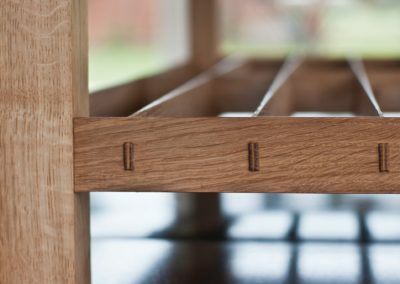 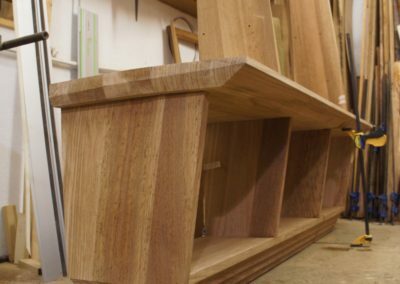 English oak was used for the finely hand cut dovetail desk drawers which were finished with cedar of Lebanon drawer bottoms. 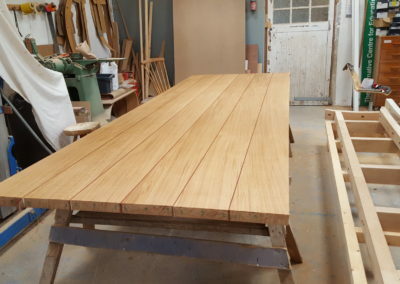 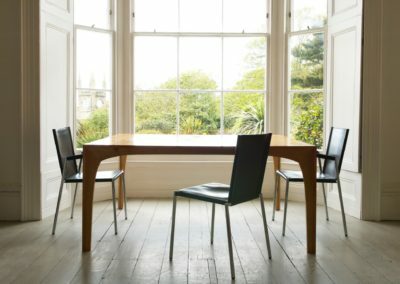 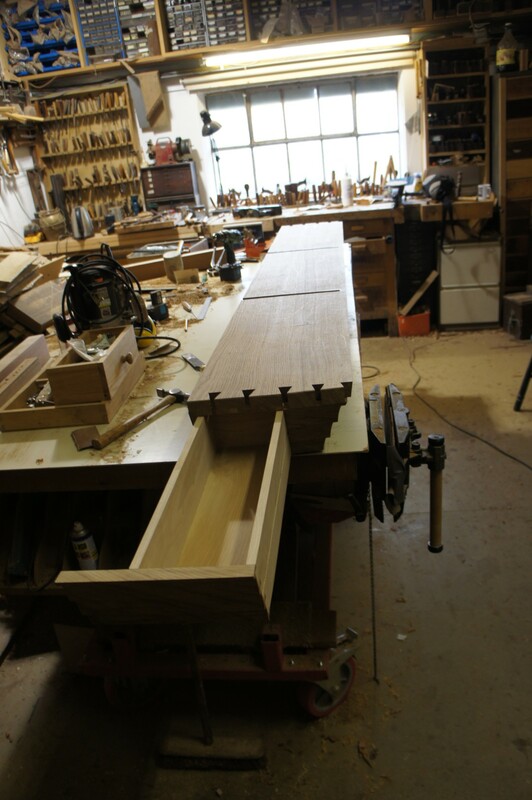 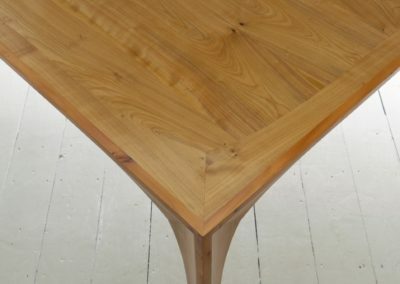 Named ‘Large Flat Surface’ (LFS), this dining table sits 14 to 16. 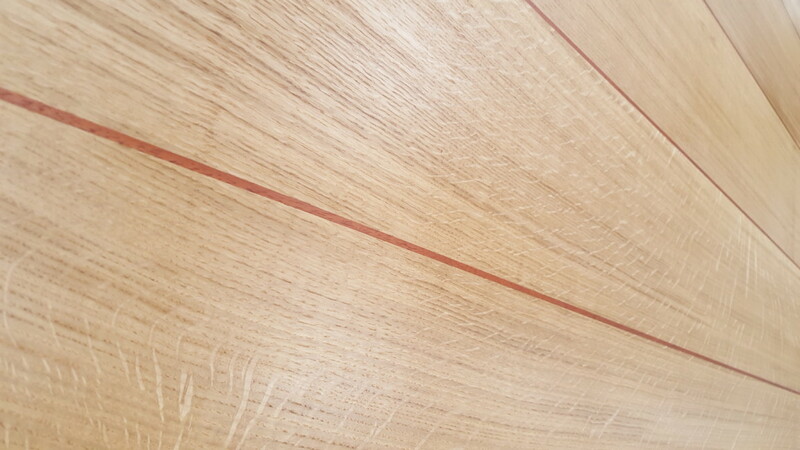 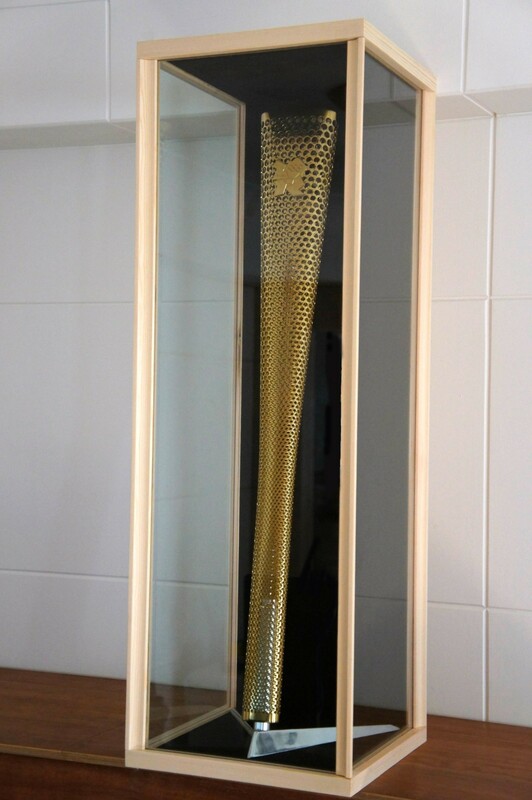 It is made of quarter sawn planks of English oak, which is the best cut of English oak as it shows the medullary rays of the tree to best advantage. 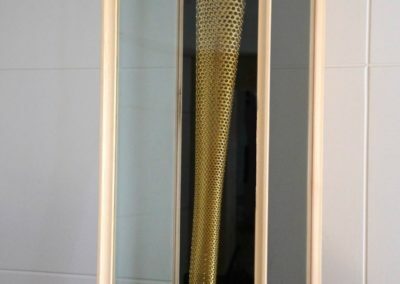 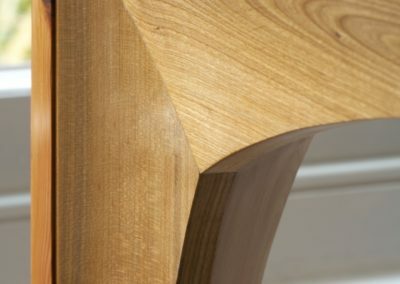 This can be seen in the subtle wavy patterns in the wood. 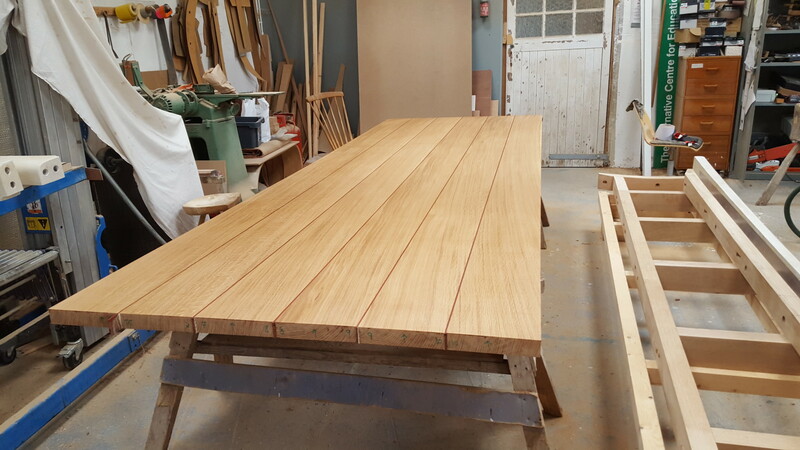 Padauk, an exotic hardwood, has been used to enhance the planks with a red striped detail. 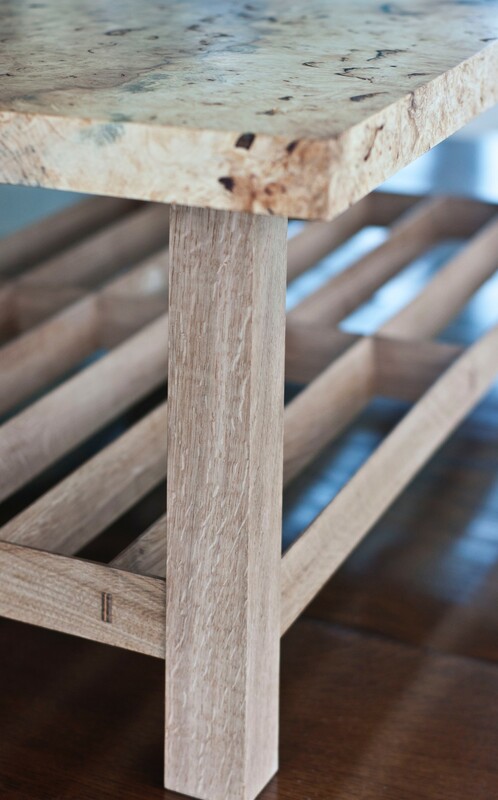 The oak of the undercarriage has been sculpted and pigmented to give a weathered texture. 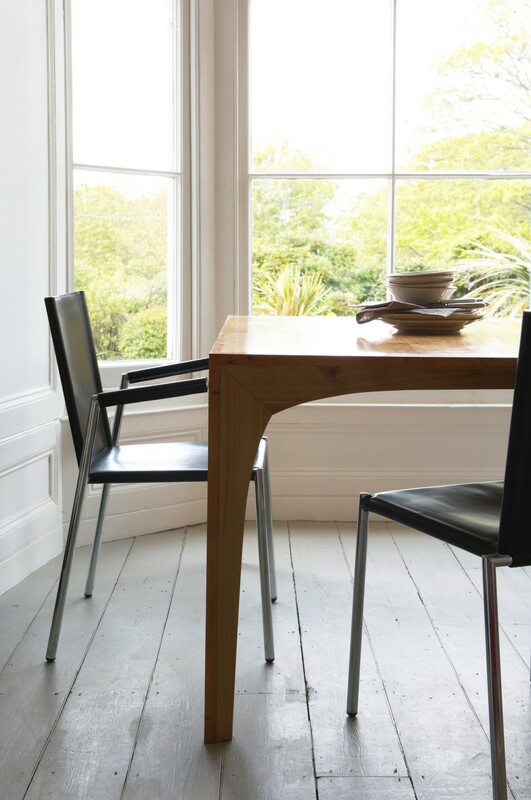 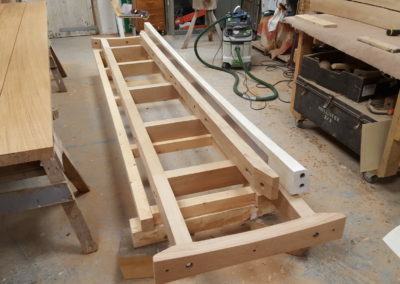 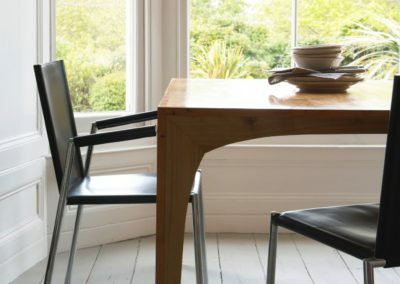 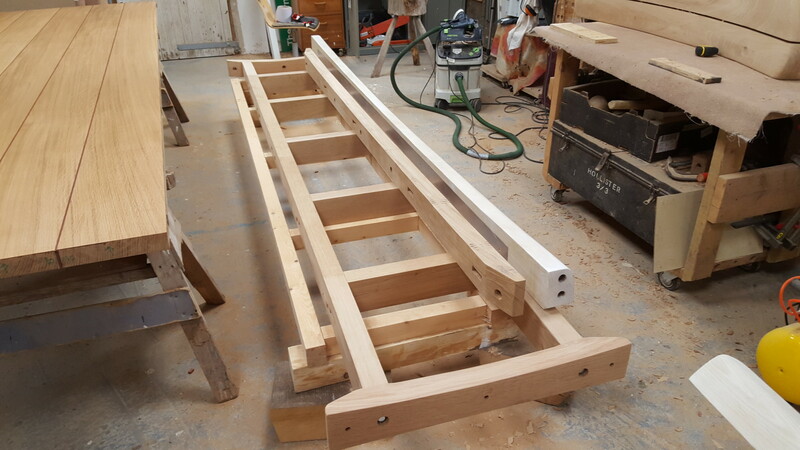 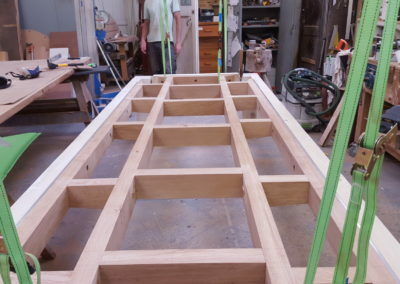 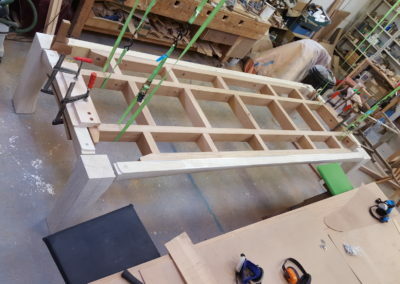 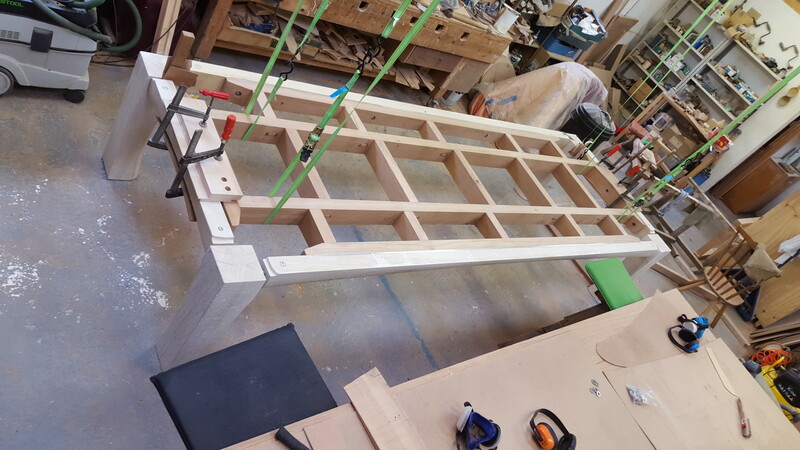 The table is strengthened and stabilised by the addition of a mortised & tenoned backbone ladder which stops the table from bowing under its own weight. 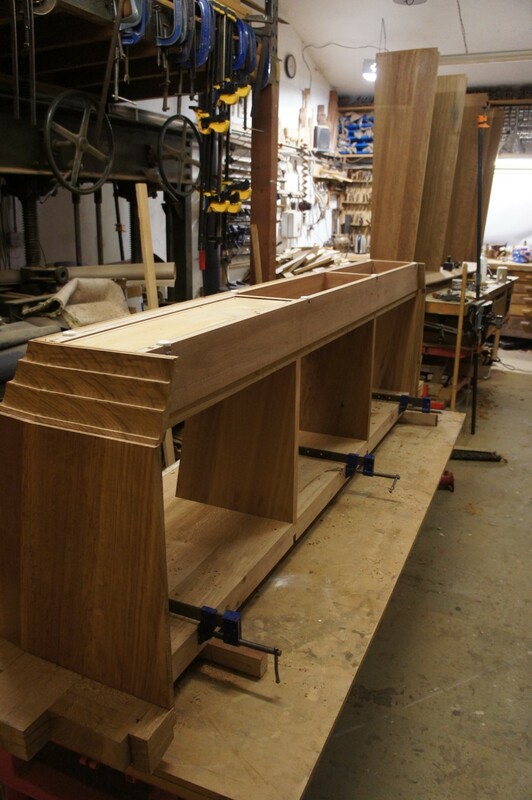 The tenons are wedged with padauk which ties in with the red stripe detail in the table’s top. 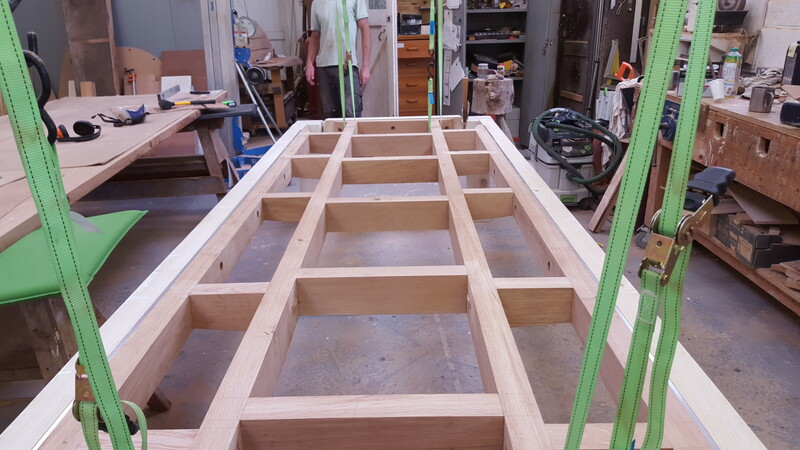 LFS requires ten men to lift it so is only suitable for ground floor positions. 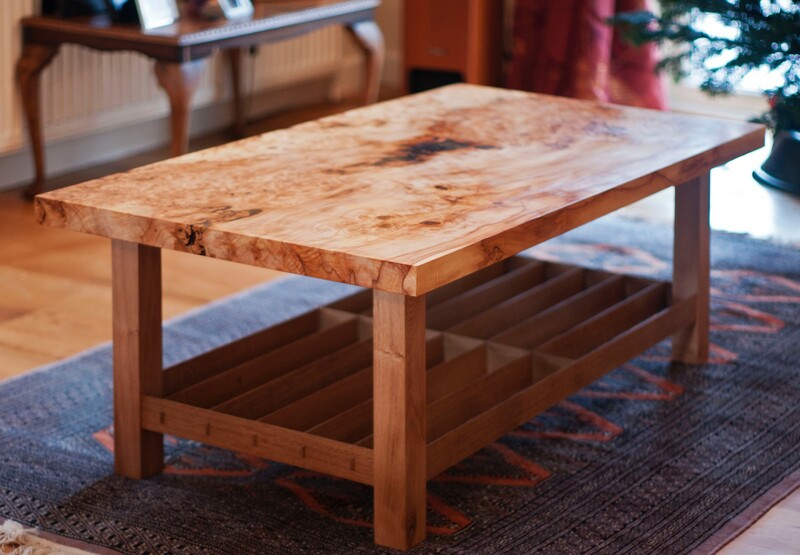 This coffee table was commission by a private client who had seen our work previously on his travels. 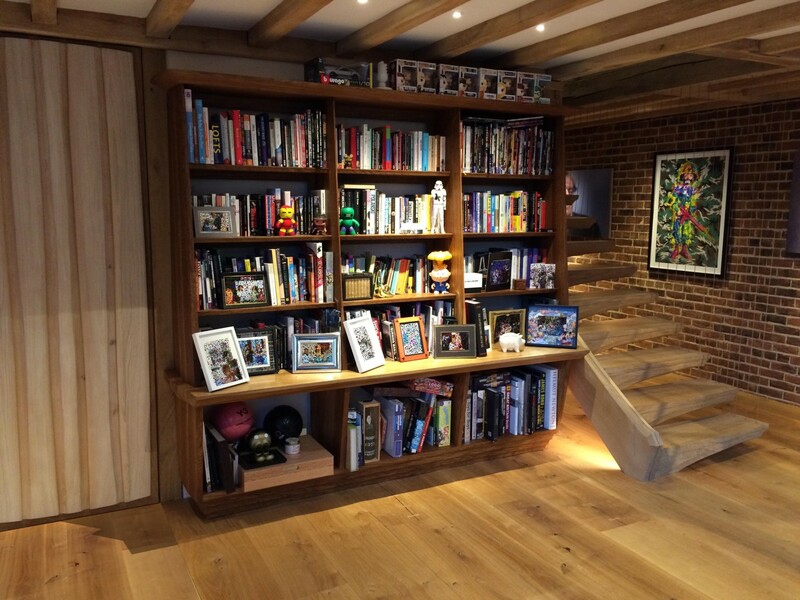 The client approached SA Spooner with a specific idea in mind. 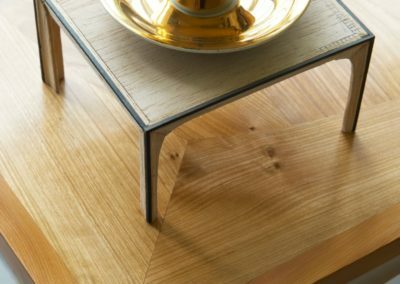 The materials brief was for the top of the coffee table to be made from a stunning piece of wood that was light in colour with balance of detail; the base to be simple in design, with a magazine rack. 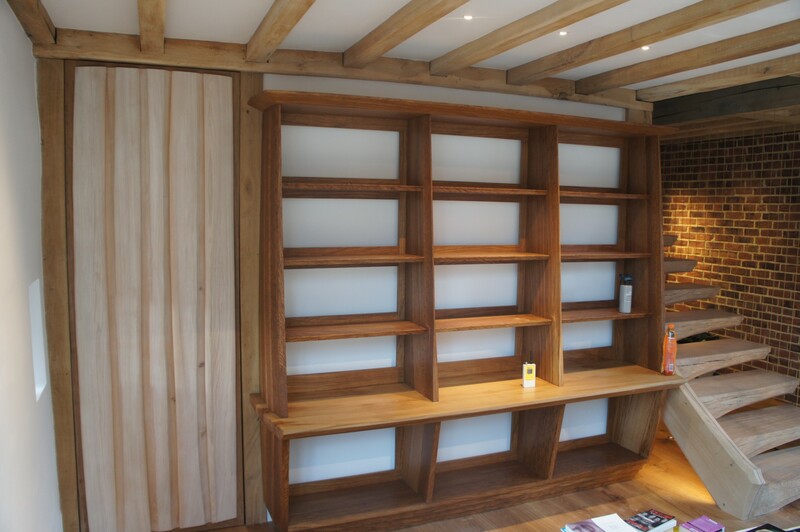 Design and choice of wood is subjective, some clients prefer that we work closely with them, some require an end product. 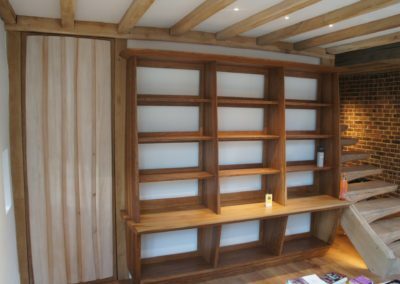 This client wanted to be part of the process from initial design through to end so we worked alongside him on every detail. 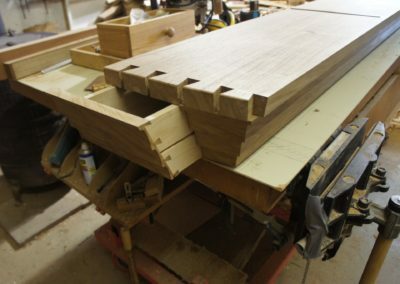 The piece of wood used for the top was found on a random trip to a saw mill. 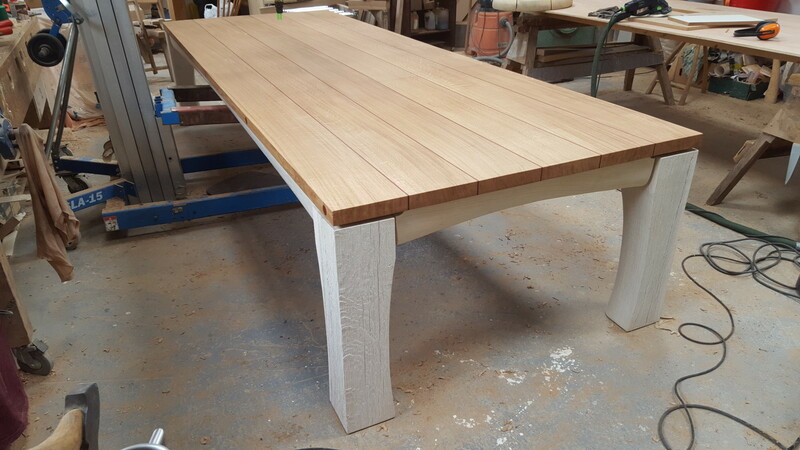 The client was invited to view the piece and confirmed that it fitted his image of the coffee table he wanted made. 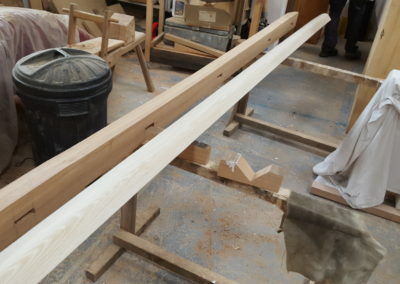 The wood is horse chestnut which is not a commercial timber. 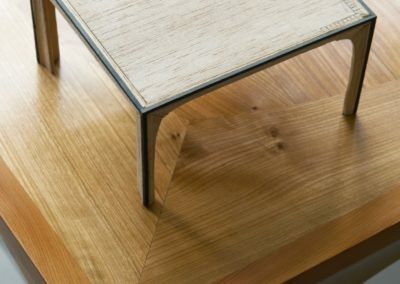 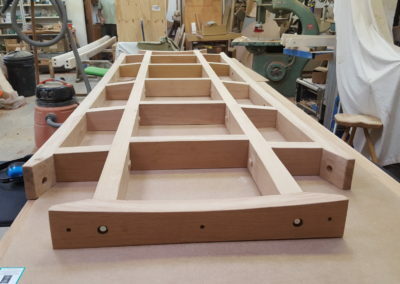 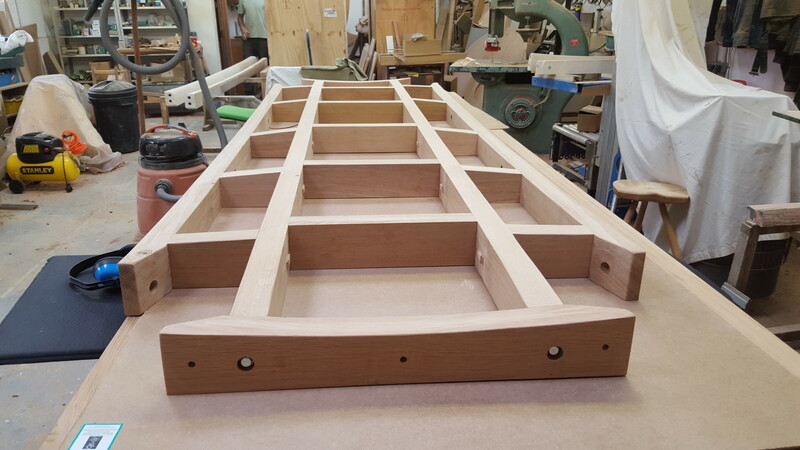 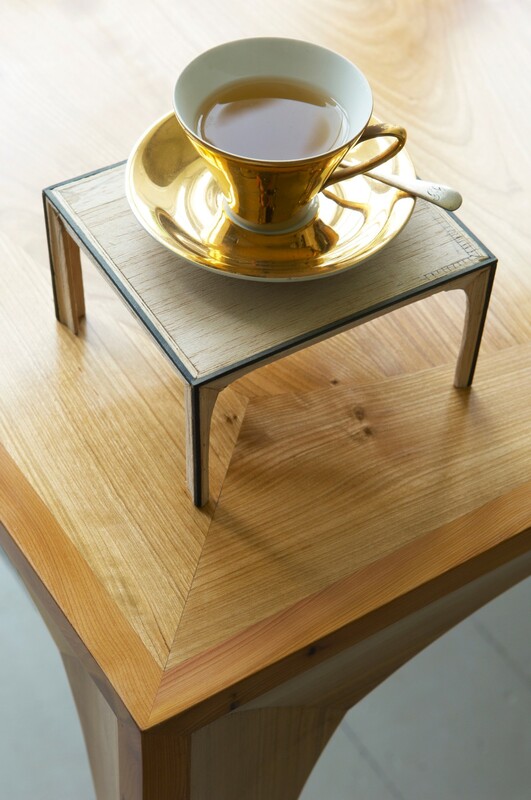 Before the piece of chestnut was crafted, a mock up of the coffee table was produced in pine for the client to have in his home to ‘live with for a while’. 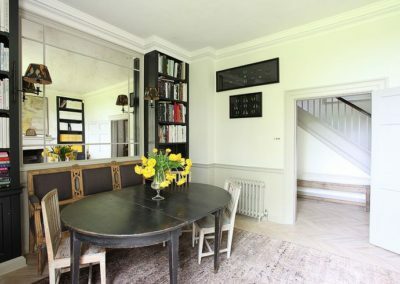 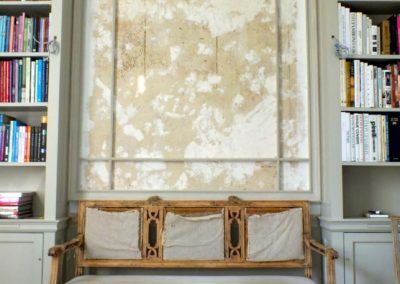 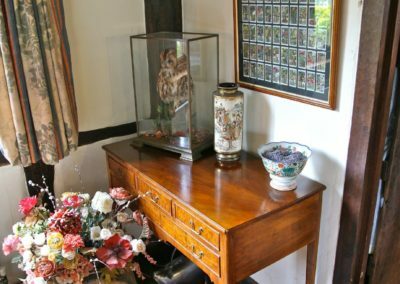 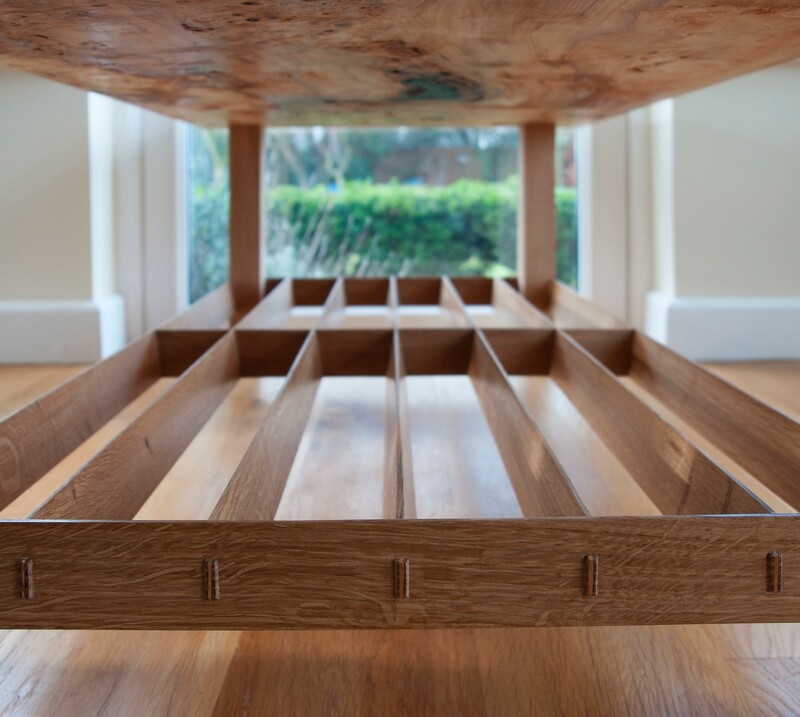 This gave him a chance to have the table in place so to see whether the dimensions where right – it also gave his wife the opportunity to see the piece in place and give her own feedback. 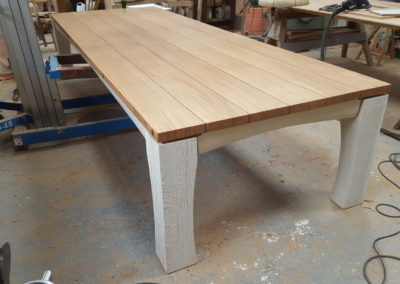 Finally, after some minor amendments to the size, we were given the go ahead to cut the precious piece of chestnut and craft the table. 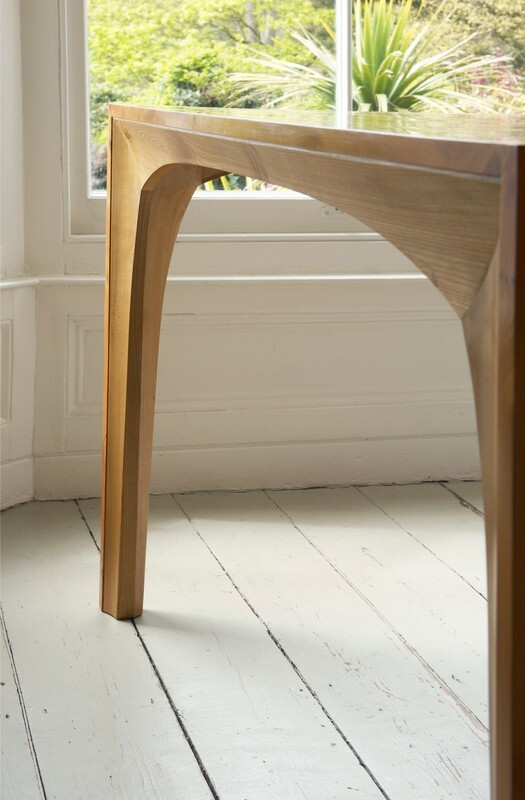 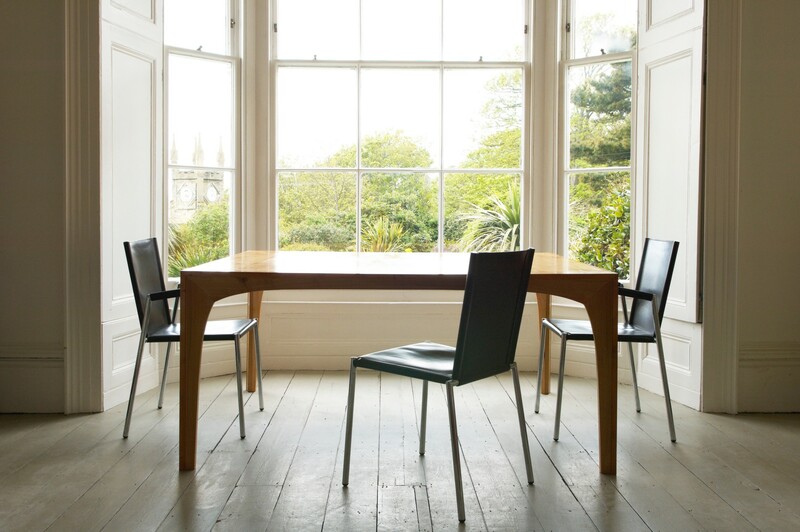 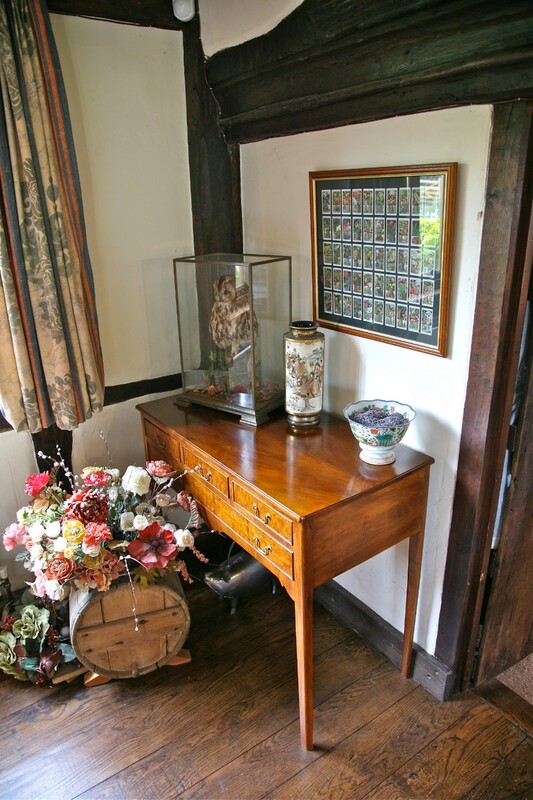 The base of the table is made in English oak from a tree in the client’s own garden that fell during the 1987 storm. The client enjoyed the process and now owns a coffee table made exactly to his own personal specifications that he loves.